You like it hot. Really hot. But do you know how to successfully grow super hot peppers? There are a number of differences between growing hot peppers and other vegetables. What works for bell peppers, cabbage or carrots won’t necessarily work for these super hot peppers. Even seasoned gardeners have trouble germinating super hot peppers. We encourage beginners to start with live hot pepper plants. The hardest part, germinating, is already completed for you. As a member of the nightshade family, super hot peppers have some specific requirements that seem counter-intuitive when you’ve grown other fruits and vegetables in the past. Here’s our ultimate guide to growing hot peppers to help you successfully grow hot peppers from seed to harvest. 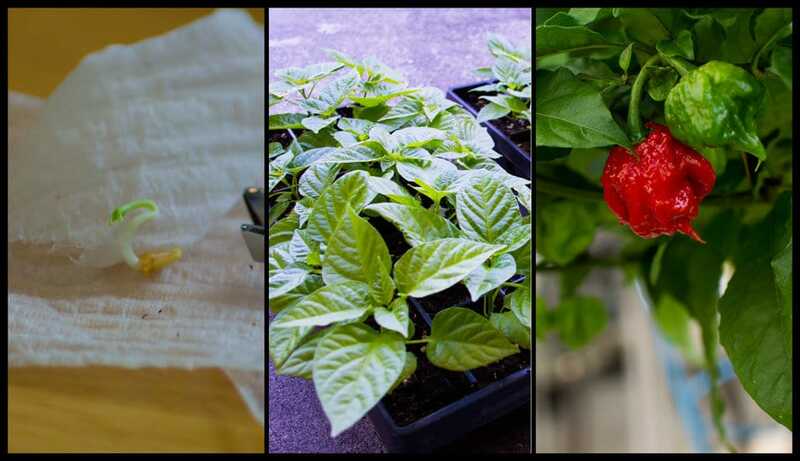 There are many methods to starting hot pepper seeds, but we highly suggest the paper towel method. This is a fool-proof way of starting small batches of pepper seeds. Wash hands and use disposable latex gloves to avoid contaminating the seeds with unwanted bacteria or fungi. First soak the seeds in a 50/50 mixture of water and hydrogen peroxide for 5 minutes to kill any bacteria. Now, soak seeds in our Seed Germination Accelerator for a minimum of 12 hours and maximum of 24 hours. Then rinse seeds and place evenly spaced on a damp paper towel. The paper towel should be damp, but not soaking, like a wrung out sponge. Next, fold the paper towel in half and place in a zip lock bag. Don’t squeeze out the air in the bag. Leave a large air bubble to provide the seeds with oxygen. We are trying to recreate a humid rain forest-like environment and the seeds need oxygen to germinate. A barrier between the bag and heat mat, like a thick towel, will prevent large temperature swings. Over the next couple hours you will see water droplets condensating on the top of the bag. Add water as necessary to prevent the paper towel from drying out. You shouldn’t be losing water very fast as it is pretty much a closed system. Be patient – Super Hot Pepper seeds can take anywhere from 14 to 30+ days to germinate. Monitor the bag and open every few days to check for little white roots popping out of the seed shell. As soon as seeds “pop” transplant into a cell tray or a small pot with fresh potting soil. Bury seed about 1/4″ deep with the root pointing down. The seed soaking step with the Seed Germination Accelerator is not to be skipped over. It is a requirement. This is called seed priming in the scientific community. Priming is scientifically proven1 with peer reviewed articles to reduce germination times. Superhots take time so follow the steps above and give them plenty of time. These are not Jalapenos or Habaneros which take about 7 days. Superhots takes about 30 days and up to 100 days to germinate. Germination can be irregular in some varieties. Some of the seeds can germinate in a few weeks while others from the same seed stock can take over a month. Once your seeds have sprouted, you can reduce the temperature to 70ºF and make sure the seedlings are getting between 14-16 hours of light every day. Grow lights should be 7-12″ above the leaf canopy to avoid burning of leaves. Don’t over-water the pepper seeds, as this can cause them to rot or cause damping off. The soil surface should dry out slightly between waterings. You’ll want to avoid using plastic covers, as this can retain too much moisture in the soil and plant environment for many hot pepper varieties. Add a fan or other source of ventilation to provide oxygen to the germinating plants and prevent damping off fungus. Water plants when lights are off for the evening as water droplets create a magnifying effect with the light and can burn the foliage under the water droplet. Once your seedlings have reached a height of 2″, it’s time to start fertilizing. Start with a half-strength solution of a liquid plant fertilizer when you water once a week until the plants reach 4″ in height, at which time you can switch to full-strength liquid fertilizer. Some gardeners have had issues with seedlings being burned by some strong mixes, so we typically use a fish fertilizer to avoid this issue. As your seedlings grow, keep an eye out for downy mildew, aphids, white fly and other pests that can be problematic for your plants. While there is no “best” brand of potting soil, there are things to look for in a quality potting soil for growing huge pepper plants. What soil does PepperHead use? We use FoxFarm Ocean Forest Potting Soil (link to Amazon) on all of our live pepper seedlings. This soil meets all of our recommendations and this stuff delivers results! Just add water and watch them grow! This soil will need organic fertilizer after about 1-2 months or whenever growth slows. Yes, you can even grow the smallest of seedlings in this stuff! It won’t burn them. Once your plants reach 8-12″ in height, it’s time to put them in the garden or permanent containers. If you’re planting outside, be sure to wait at least two weeks after the last frost date in your area to prevent losses to sudden cold weather. Peppers are sensitive to cold temperatures. Freezing or even near freezing temperatures will significantly retard growth and likely kill young seedlings. Before transplanting, gradually introduce the seedlings to more direct sunlight over a few days. Move the pots closer to the actual planting location. This will give the plants time to adapt to their new environment and harden their leaves and stems. Plant the seedlings 2-3′ apart to ensure plenty of space later in the season. If you’re planting in a container, you’ll want to use one that has at least five gallons of capacity to ensure there is plenty of room for the roots to grow. 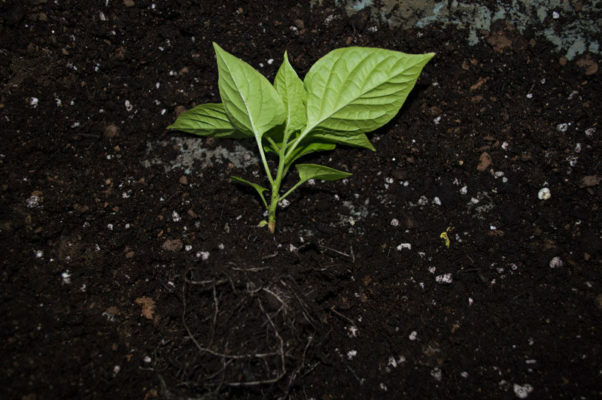 Make sure to add lime or bone-meal to the soil when transplanting, as nightshades tend to go through a lot of calcium during the growing season. Fertilize with an organic fertilizer at the time of transplanting. You may want to consider adding a root-promoting fertilizer to encourage rapid root growth, or you can mix one aspirin tablet in a gallon of water to reach a similar effect. Top dress with mulch to prevent weeds from shooting up and stealing the nutrients your pepper plants need to grow. Mulching also keeps the roots cool and moist. Water thoroughly after transplanting and keep a close eye for the next few days as transplant shock is very real. Make sure to provide support for the plants throughout the growing season by either staking or using tomato cages. Later in the season when fruit is set, strong winds can break heavy branches. Pepper plants tend to go through a lot of calcium and phosphorus in the growing season, so remember to add a sprinkle of bone meal to the surface of the soil every four weeks, going to every two weeks once the plants start to really put on flowers and through the fruiting cycle. This simple addition of bone meal will prevent a host of calcium deficiency issues including leaf curl and blossom end rot on fruits. If you’d rather use material that is not animal based, you can add a sprinkle of mixed lime powder and wood ash to achieve the same results, but be sure to use ash from actual wood, not artificial logs. Peppers that have insufficient calcium tend to develop blossom end rot at the ends of the fruit or the deficiency might show up in the new leaves as crumpled or crinkled leaves. This is a permanent deformity and once calcium is applied, only new leaves will grow correctly. Why aren’t my pepper plants flowering? Pepper plants will only flower once the plant is established and healthy enough to support fruit production. Fruiting takes an immense amount of energy from the plant so it will only flower when it is ready. Pepper plants NEED full sun! If you’re having issues with fruit not setting, you may have insufficient insect populations to pollinate the flowers or excessive nitrogen in the soil. You can hand pollinate by using a damp brush and picking pollen from one flower, then brushing it on surrounding flowers. Though there are some exceptions, most hot peppers take 90-150 days to produce ripe fruit after planting. By following the steps and tips outlined in this guide, you can enjoy wonderful hot peppers straight from your garden or container without making all of the common mistakes. Take the time to start your plants correctly and enjoy the fruits of your labors for months to come. All of the same pests that affect your vegetable garden will also affect pepper plants. Keeping plants healthy and happy will increase their natural ability to protect themselves from pests and diseases. Be sure to spray tops and bottoms of all leaves. The hard part is over! Now comes harvesting. Once peppers completely change colors they won’t grow in size anymore and are ready to be picked. The fruit should pop off easily by holding onto the stem of the fruit and angling it upward. It will make a crisp snap off the plant when fully ripe. Pepper fruit will store the longest when placed unwashed in a ziplock bag in a refrigerator or freezer. Remove any partially rotting peppers or they will reduce the shelf life of the entire bag. Wash fruit right before use. Since superhot pepper plants take so long to grow many people turn to overwintering to save their plants from freezing winters. Pepper plants won’t survive temperatures lower than 32° F or 0° C so bringing them in for the winter is a must for non-tropical regions. This will save months of growing time in the next season. Keeping pepper plants in pots year-round makes it easier to overwinter. We hope our Ultimate Guide to Growing Hot Peppers has helped you with maximizing your pepper harvests. Please give this guide a share if it has. Comment below with tips or tricks you find helpful when growing your own hot peppers. We might even add them to our guide! Happy growing! This entry was posted in Growing Peppers and tagged growing hot peppers, super hot peppers, ultimate guide. Hello! When you say “full sun”, how many hours of full sun should a Carolina Reaper have as a minimum to produce the peppers? Thank you very much in advance! Trying to grow Thai Chilies. Been on the cotyledon stage for the past 2 weeks. Anyone knows how long before first true leaves appear? I don’t have any experience in growing peppers, and I need a grow tent to get the temperatures right any suggestions? Help me po..i need a title of this super hot pepper for my thesis title po..this is I want to conduct this situation of hot pepper..please help me I’ll wait your response po..
Hey everyone, I got an update on my peppers. They are big, strong and happy. I have come upon an organic plant food. I follow videos from a site called MIGardener. great information. They also make their own plant food which I have been using. Holy crap does that make a difference! It’s organic, you need only three tablespoons or so and it will feed your plant for the rest of the year. It’s called Trifecta and I highly recommend it! Sorry I didn’t mean to plug this thing like this, but if your peppers need help, this stuff does the job. years old some 3 plus do you think they are still good to germinate ? I’ve germinated older seeds, but all depends on how they were stored. Heat, light and moisture are seed killers. Definitely prime the seeds and use the paper towel method as described in the guide. It can’t hurt to try to germinate them! Hey not sure what type of hot pepper seeds you talking about but I have never seen pepper seeds take 100 days to germinate. Shaheed, you are correct in that it is not normal for pepper seeds to take that long to germinate, but specifically super hots do take significantly longer to germinate than “normal” hot peppers. I have adjusted our guide to more standard germination times (14 to 30+ days). 100 day germination still happens all the time for us when we grow 1,000’s of plants for shipping across the nation. Hi everyone I have a few more tips for you, but this is when they get into the ground. So, my peppers tend to get hot… and I mean HOT. I grew jalapenos that will blow your mind, but I think I know why that is. They are planted with the other very hot peppers. So if you like spicy jalapenos, plant them with spicier peppers :p.
And this trick is going to sound strange, but when the plants are ready to go into the ground, put in unlit matchsticks into the hole. Strange right? Matchstick heads are composed of sulfur, and the peppers LOVE it. Place them head down though, and if you feel risky place some head up. I have placed them head up, but it has come to my attention this could burn the plants. I did find mine took a while longer to take off when doing this. So head down and not too deep so they can find the matchtip. (I do about three per hole) with about a table spoon of epson salts. Plant your peppers close, but not too close to each other. This part will sound nutty to a lot of you, but peppers plants DO communicate with each other through the soil. So keep them happy and give them a friend. :p But also given them space. I hope this helps everyone, good luck and happy planting! Great information as always Shannon. An alternative to matchsticks for sulfur is Epsom salt. Epsom salt is comprised of Magnesium and Sulfur. Hot Peppers love Magnesium too! Less is more, 1 Tablespoon per gallon will do. Foliar spray or root drench. Less than 4 hours later two Thai Hot and 2 Carolina Reapers are up! From everything I’ve read this isn’t suppose to be this easy. Do you think that the Tea helps that much? wow that is fast! Keep a close eye on them, it anything, you got some very eager pepper plants! I planted 23 Carolina Reaper seeds, thirty Devil’s Tongue, 41 Thai Hot, and 55 Yellow Trinidad Moruga Scorpion seeds. All were soaked in Bigelow’s Constant Comment Tea for about 5 minutes. In five and a half days one Devil’s Tongue and 3 Scorpion have germinated! Whoo Hoo!!!! It works. Thanks Shannon. I’ll update how many more and how quick later. Thanks again. Awesome to hear! It’s always awesome to hear when a method I have used worked so well for others. Interestingly though, mine took their dear sweet time this year, perhaps I shouldn’t try and sprout them in a basement :p But congrats to your success so far! Shannon, these are all great tips! Soaking in warm tea definitely speeds up germination. I might even add that to our tutorial, thanks! Hi, What kind of tea do you soak the seeds with? Can you share and describe the process? How long do you soak the seeds in the warm tea? for me I only soak them for a minute or so. This is great advice. What kind of tea? What temperature on the tea do you recommend? I would probably go with about 70 degrees C.
try ladybugs. you can buy them online. Sounds like aphids and there are a few ways to try to get rid of them. You can try ladybugs or green lacewings which eat aphids. You can dilute neem oil in destilled water and spray onto plants. Or you can stir together 1 quart of water, 1 tsp of liquid dish soap, and a pinch of cayenne pepper (optional) and spray onto your plants. The honeydew secreted by aphids also attract ants who will try to protect the aphids, so check for ants before you try and get rid of them. If you find them lure them away with ant traps or a small container of water before trying to deal with the aphid problem. are there a lot of them? If there are, then yes go with Bug Buddy’s suggestions, if you have a few I have an idea. This may take more time, but in the end, it can get a good chunk of them out. Take normal packing tape and wrap it on to two of your fingers, sticky side up of course, go around and just use the tape and dab them on. The tape doesn’t stick to the plant well, but the bugs, oh yeah! Granted this is tedious and can be a big pain in the a$$ to do, but if they are few, this can clear them out rather quickly. I have a ghost pepper which I managed to house over the winter. It now has about 1/2 dozen peppers. I am waiting for them to ripen. What I’m wondering is can I save the plant again) and grow fruit next year or will this dilute the heat from the peppers? You can continue to grow hot peppers for many years. In fact many second year plants produce better fruit than the first year. In good conditions its not uncommon for a plant to survive and continue to produce for about 5 years on average. Hi, what do you guys recommend when your hot pepper’s leaves just won’t get nice and big like those in the picture you have? Through my lack of patience and cash, I have experienced too much moisture in my pepper plants, thus making them stunted in early growth and yellowing leaves. I clearly did not include enough organic matter deeper into the soil (soil dug up from sod) in order to drain well. I bought lots of veggie gardening soil, and I’m creating small raised rows to help this. I have treated peppers similar to tomatoes – but tomatoes will grow anywhere. I had one grow out of a pile of leaves in the back of my compost pile. 🙂 Good luck! how well fed are these? How is your soil? Do they have enough nutrients? I just posted above, you can give them a cheep fertilizer with a small bit of epson salts, and unlit match sticks. If they are already in the ground, sprinkle the epson salt on the tip of the soil. The matchstick stick into the ground head side down and towards the plant, but don’t do it too close for it may burn the plants. Good luck! I bought seeds in 2015, and had 4 plants in 2016. I had trouble getting them to fruit. I wrote and you gave me some advice and it helped. I had thought of them like tomatoes so I starved them for water when they didn’t start setting right away. After your advice I doubled the water and some of them set. I live on a farm in California and a lot of the people who work for me think of themselves as “fire-eaters). Last year I taught a few of them what hot peppers were really about. I covered my plants with clear plastic over the winter and it looks like maybe all of them will live. I had two Scorpions, a Moraga and a Trinidad, I can’t find my planting map right now, but one of them is alive, and the other is hopeful. My Carolina Reaper is a hopeful, and my 7 pot is alive for sure. I’m excited to see what happens this year. Maybe I’ll order a few plants and expand my garden.